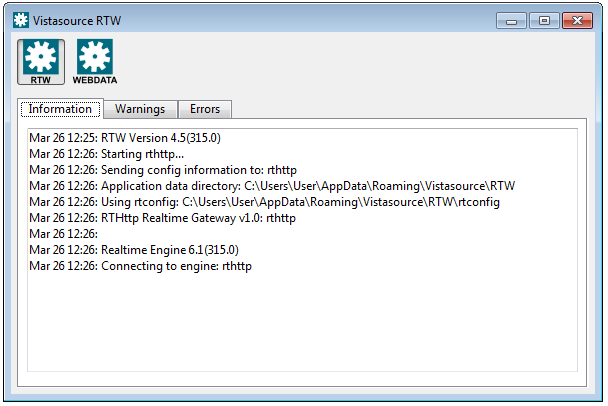 The RTW status window displays information such as the version numbers for RTW and its engines, RTSHARE, network status messages, status messages from the data distribution system (errors, warnings, etc), as well as other relevant status messages. Any invalid field or record names encountered by the service will also cause a message to be posted to the status window. If you are not receiving the expected real-time data in Microsoft® Excel, check the status window for relevant messages. You can show or hide the RTW and RTSHARE Status Window by selecting Vistasource → Info → Show/Hide Status Window. The status window will automatically close when no engines are running. An engine will shutdown, if it is not handling any more real-time requests. The debug level and display rules for the RTW Status Window can be changed in the Status Window section of the Rtconfig Editor Generic Tab. See the engine-specific manual in the installation directory for detailed information about the different methods of editing the RTW configuration options.